Estate Wines from MauiWine. Courtesy photo. 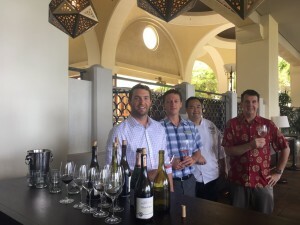 Fairmont Kea Lani’s lobby bar, Luana, sets the stage to celebrate the release of MauiWine’s 2015 Ulupalakua Vineyards chenin blanc and rosé, along with its 2014 viognier, grenache, malbec, syrah on Thursday, April 7 from 5 to 7 p.m.
For $30, guests will receive a tasting ticket for each of the six wines with food pairings by Executive Chef Tylun Pang. 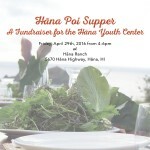 They’ll also get a commemorative MauiWine glass and enjoy live music entertainment. 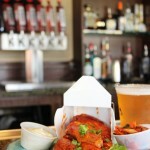 Pang masterfully pairs the estate wines with locally-inspired tapas to showcase the bounty of Maui’s fresh ingredients. “Luana celebrates the modern pau hana culture of Hawai‘i through its curated beverage program, locally-sourced cuisine, music and more. Supporting our local farmers allows us to share the freshest and finest ingredients with our guests,” explains Pang. 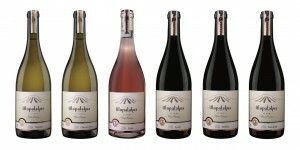 This is the first time MauiWine is having a release celebration for its estate wines – 100% grown on its ‘Ulupalakua Vineyards. MauiWine currently farms 16 acres of six varietal of grapes including syrah, malbec, grenache, viognier, chenin blanc and gewürztraminer. MauiWine is the largest winery in the Hawaiian Islands and the only one on Maui. Since 1974, it has been committed to growing and creating quality wines that capture the essence of Maui through its pineapple, estate-grown and traditional-method sparkling wines. 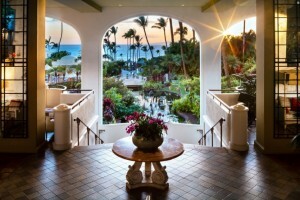 The lobby bar at Fairmont Kea Lani, Luana, during sunset in Wailea. Courtesy photo. MauiWine at Luana, the lobby bar at Fairmont Kea Lani. Courtesy photo. After the official release, the estate wines will be available for enjoyment at Luana through April 17, 2016, or at MauiWine’s tasting room, where residents and visitors can purchase the bottles. The King’s Visit excursion is another way to experience the wines. 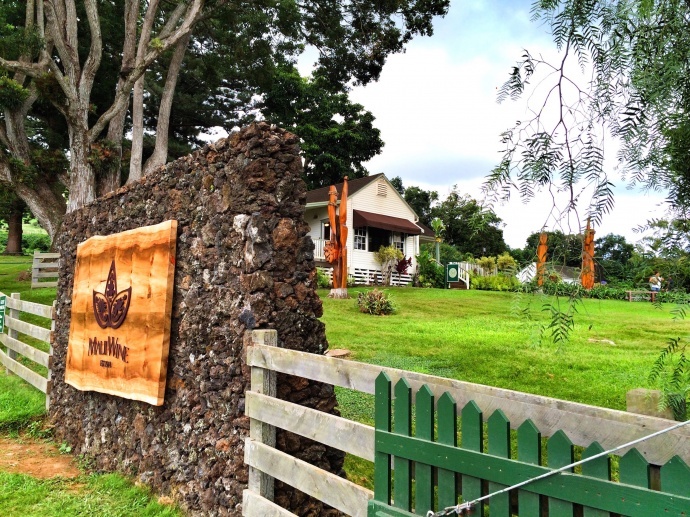 The exclusive tour and tasting experience of MauiWine’s small production and estate-grown wines at ‘Ulupalakua Vineyards is currently available two times a week, on Wednesdays and Thursdays at 4 p.m. for $50 per person. Learn more about MauiWine here. Luana is open daily between 4 and 11 p.m., with live music nightly between 5 and 10 p.m. Limited reservations for this exclusive event are available by calling Fairmont Kea Lani concierge at (808) 875-4100. For more information, please visit here.